Waterstones Cafe is a haven from the high street where you can relax and read a book, meet friends, eat, or catch up on emails using our free Wi-Fi. Sweet, savoury and a little spicy, our vegan cheese and chilli jam toastie makes for a delicious lunch. 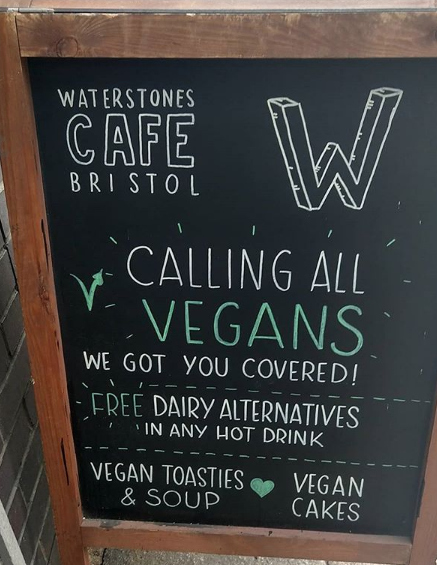 Here at cafe w we have a full selection of plant based milk alternatives for no extra charge! Just ask your barista. Ride out the summer with Minor Figures cold brew! We stock black, mocha and latte, all dairy free and vegan. It’s back! Our vegan BBQ pulled jackfruit sandwich has returned ready and waiting to be grilled up just for you! With vegan cheese and rocket on sourdough who can resist this hearty plant based lunch?